Thank “Chukwu okike Abiama” (Creator) who’s by His Esteem power upon His great servant, son Mazi Nnamdi kanu the Supreme leader of Indigenous People of Biafra, Director radio Biafra and Biafra Tv. 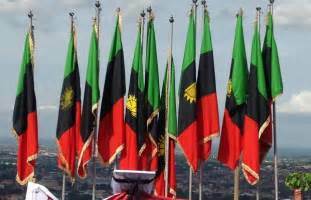 That today it is a dawn of new era, the unity that once existed before 1954 has enveloped Biafra again. From coastal town of warri to coastal town of Igwuocha (Port Harcourt) all what people are shouting is Biafra and Referendum, from hinter land of Onitsha to Southern Cameroon all what the people are shouting is Biafra and the enthusiasm is like wild fire burning dried grass in harmattan season. Finally the hypocrisy of Nigerian government and their British slave master has been detected and will soon be finally terminated. the party continued until 1944 when Dr Nnamdi Azikiwe formed his National Council for Nigeria and the Cameroon’s to accelerate the pace of the struggle for Nigerian independence. Azikiwe included the name Cameroon in the party to show that the future of British administered Southern Cameroon lay with the former eastern region (Biafra) and there was no opposition from people of that axis in any form. Soon afterward the party (N.C.N.C.) became the leading political party in Nigeria and all over Africa. This achievement attracted the name great Zik of Africa to this illustrious son of Biafra. The activities of the party continued to dominate Nigerian political land scope till 1951 when other political parties began to emerge to champion ethnic course encouraged by Britain the imperialist. The following political parties emerged in 1951 to champion various ethnic courses in the contraption called Nigeria; Action Group led by chief Obafemi Awolowo (West), Northern People Congress of Ahmadu Bello (North), Northern element progressive union (NEPU) led by Mallam Aminu Kano (North), United Middle belt congress (UMBC) led by Joseph Tarka (North). that only one political party was formed in the east is a testimony to the homogeneity of value system even down to the British administered (Trust territory) Cameroon Dr Emmanuel Lifafe Endeley was elected on the platform of N.C.N.C. to the eastern house of assembly in Enugu together with two others N.N Mbile and S.T. Muna. Endeley was latter overwhelmingly elected to be one of the representatives of the eastern region at the federal house of representative in lagos. To non-Ibo Biafrans from eastern region Eyo Ita was an outstanding member of the eastern regional house in Enugu where he was second only to Azikiwe the founder and leader of N.C.N.C. contested election in which he was opposed by Samuel Akinsanya a Yoruba man who saw him as omo wale (A Yoruba word for people of Biafra). This support enabled him to defeat his rival and was elected to the legislative council in lagos under the platform of Nigerian youth movement in 1941. This harmonious relationship was not to the liking of the colonial master (British Empire). They know quite well that Biafrans are intelligent and ingenuineous people. They decided to do something to balkanize us. Their evil plot started by instigating the people of Southern Cameroon who were enjoying harmonious relationship with their brothers in the eastern region of Nigeria to agitate for autonomy. Soon they encouraged the leader of Southern Cameroon Dr Emmanuel Lifafe. of criminal suppression by Hausa- Fulani Sokoto Caliphate while northern element progressive union of Mallam Aminu Kano stood to fight for more progressive north with enlightened minds. According to professor Sambwas from Adamawa State (Senator) N.E.P.U. had better policy and programmers but was brutally suppressed by N.P.C. with the help of Colonial master why didn’t Britain listen to the yearning of these people? They rather turned their attention to the east where they saw perceived enemy because of their “Creator” given ingenuity and considered easterners impediment to their evil and selfish economic interest which care nothing about the owners of the resources they are looking for rather criminal exploitation coupled with dehumanization. Thanks to people of Biafra for their courage as epitomized by the Aba women riot of 1929 and the agitation by coal workers in Enugu in 1949.
realized that he has been deceived by the colonial master. The remorse shown by Eyo Ita was exemplary in the sense that during the Biafra war he was on the side of Biafra. He acted as Biafra travel representative on many occasions soliciting support for the Biafra course in a number of countries in Europe and America.